In 2018, SVT and the Harvard Conservation Trust successfully protected Horse Meadows Knoll, a beautiful 47 acres on the Harvard-Boxborough line. Now, the Boxborough Conservation Trust (BCTrust), with SVT’s assistance, has a chance to conserve the adjacent Elizabeth Brook Knoll, a lovely 15-acre property that sits on the Boxborough side of the line. By protecting Elizabeth Brook Knoll, we’ll be able to extend the trail system from Horse Meadows Knoll and enable everyone to enjoy this lovely landscape. Elizabeth Brook Knoll and Horse Meadows Knoll sit at the southern edge of what we call the “High Ridge.” This 12-square-mile area in Harvard, Littleton, and Boxborough is rich with wildlife habitat, abundant native plants, and important sources of drinking water. SVT and other conservation groups are working to protect these resources before they succumb to development pressure. The conservation of Elizabeth Brook Knoll will further enhance both the recently conserved Horse Meadows Knoll and the Smith Property in Littleton at the north end of the High Ridge. All are important pieces of the effort to protect this sensitive area. Can you help put the next piece of the puzzle in place by contributing to the protection of Elizabeth Brook Knoll? BCTrust has secured an $84,000 state grant that puts a big dent in the $189,000 project cost, and a closing is scheduled for March 22. An additional $76,500 has been committed from other sources including the BCTrust, SVT, the Boxborough Conservation Commission, and the Fields Pond Foundation. But we still need to raise $30,000 to close the gap. With your support, we can reach our goal and protect this land. A grant award for Elizabeth Brook Knoll! The BCTrust is very excited to announce we’ve received a very competitive Conservation Partnership Grant award from the state to help acquire Elizabeth Brook Knoll, almost 16 acres of important woodland and habitat! However, the grant will only fund fifty percent of the purchase. Help close the gap by donating to the BCTrust. BCTrust will have walks on the property after closing this spring. For the last 21 years, The BCTrust has been involved in protecting over 200 acres in Boxborough, land critical for water, air, wildlife and recreation. We need your help now! The Boxborough Conservation Trust is pleased to present Doug Harris, the Deputy Tribal Historic Preservation Officer for the Narragansett Indian Tribe, who will explain the significance of the Indigenous Ceremonial Stone Landscape in the region. Through Mr. Harris’s expertise as preservationist for ceremonial landscapes, he will further our understanding on how to protect these cultural resources. Tuesday, December 4th at 7P at Boxborough’s Sargent Memorial Library, 427 Massachusetts Avenue, Boxborough. Light refreshments will be provided. Anne Gardulski, PhD, will lead a walk for the Boxborough Conservation Trust (BCTrust) on Saturday November 17th at 10AM on the Hager Land (behind the Sargent Memorial Library) to explore the geologic features of this glacial drumlin. A Boxborough resident, Anne Gardulski is the Chair of the Department of Earth and Ocean Sciences and Associate Professor of Geology at Tufts University. Meet in the parking lot of the Sargent Memorial Library (427 Massachusetts Ave, Boxborough). Rain date, if needed, will be Sunday, November 18th at 1PM and any changes or cancellations will be posted to the BCTrust’s website and on Facebook by 8AM on November 17th. 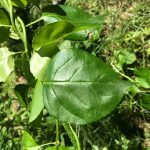 I didn’t have to go far to get pictures of this invasive species – I’d long suspected the tendrils at the side of my driveway, reaching up to grab the lower branches of my trees, was bittersweet. The benefit of getting it early is that it’s easy to pull the plant along with its roots. In winter it’s often simple to spot as it has the pretty red and yellow berries along the vine (American bittersweet, a rare non-invasive that’s threatened by the spread of the oriental version, has berries just at the tip). 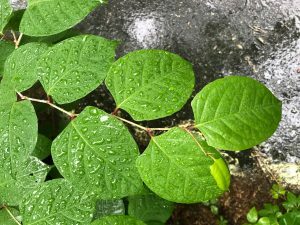 Don’t confuse poison ivy for bittersweet – PI has thick, hairy stems. It’s not so easy once it gets hold of a tree. Earlier this year the Crown Castle company volunteered a huge number of their employees to help cut the bittersweet that’s taken hold of many of the trees on the north side of Steele Farm. Once established, bittersweet can choke a tree and eventually kill it. Eradication can be a multi-year effort. 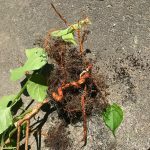 Pulling roots is the best option, but even small parts left in the ground can regrow. Cutting the vine can at least temporarily relieve the tree, but it will regrow quickly without continued work. Herbicides can be used on cut stems and foliage. Search on Google for advice on this. 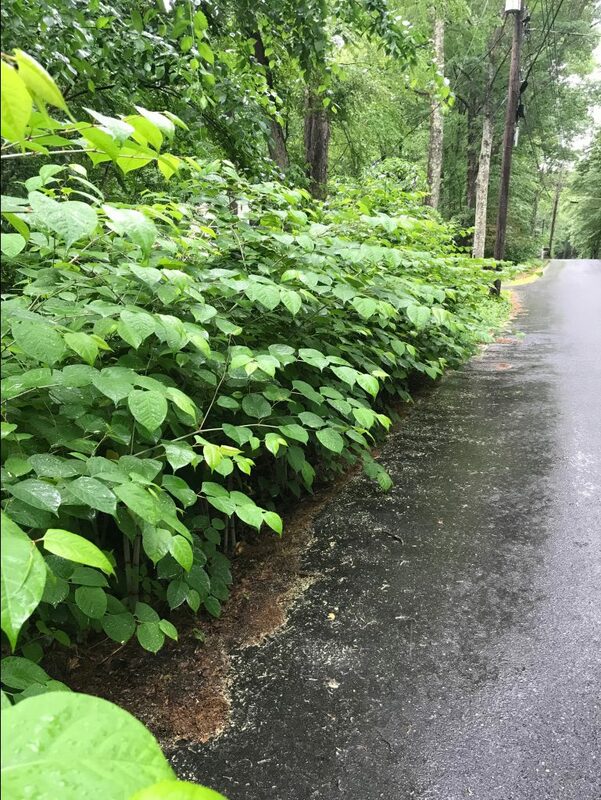 This is the second in a series of posts concerning invasive plant control in town. Just down the road from the Garlic Mustard on Depot is a large patch of Knotweed. Listed as one of the world’s worst invasives, it frequently takes over roadside areas, crowding out native plants, and destroying roads and drains. 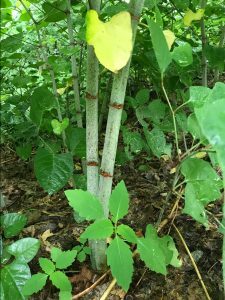 Its rhizomes can spread 20′ out and cut stems will quickly re-root, so proper disposal is important. Cutting it can eventually exhaust the plant’s energy supplies, but it often re-establishes itself. Digging it out can limit spread and eventually result in its removal. Herbicide application seems to be the most effective, but the town has no licensed applicator. This is another invasive that you’ll begin to see everywhere – Steele Farm on the south side of Middle, all around Town Hall, and so on. Keep a look out for it on your property and decide what action you want to take. 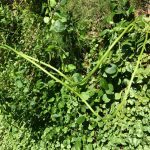 This is the first in a series of posts concerning invasive plant control in town. 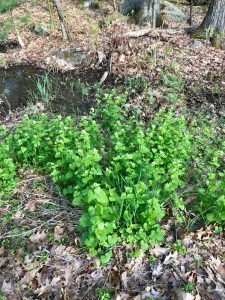 I spotted garlic mustard at the side of the road on the Patch Hill parcel. It’s one of those plants that you’ll begin to see everywhere once you recognize it. It’s native to many parts of the world, but its introduction to North America has caused reductions in biodiversity as it crowds out other plants both because it does not have a natural predator, and because it produces a toxin limiting other plant growth. Thankfully, it’s an easy one to control – the plant pulls up easily with the small tap root, though repeated observation of the site will be needed as seeds from prior years will sprout. Equally, pulled plants that are flowering can still drop seeds, so it’s best to bag it and throw it out. If you need another reason to pull it, you can also eat it – the leaves (especially the younger ones) can be used in salads or as a pesto – not surprisingly it has a mild garlic/mustard flavor. As with any wild plant, ensure you are confident that you have identified the plant correctly. 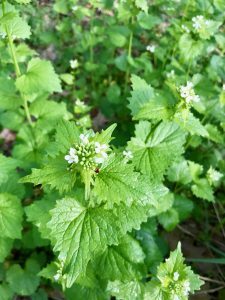 If you see garlic mustard on trails in town, please don’t hesitate to pull it up. Professor Sam Telford, an epidemiologist focusing on arthropod-transmitted infections from the Cummings School of Veterinary Medicine, Tufts University, shared the science of ticks as well as helpful information to limit our exposure to them and the diseases they carry. Thanks to Heather Fleming and Cord Awtry for videoing the talk. We’ll follow this up with more commentary over the summer. At the BCTrust’s Annual Meeting we spent 10 minutes describing the maps we have for trails in town, the fact that all of our trails are on OpenSteetMap and what technology exists to help with navigation. This is a three-minute video I showed that describes how easy the maps.me app is.